April 22nd is Earth Day around the world! 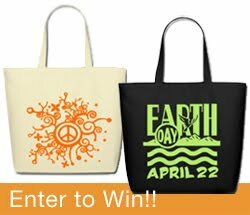 Ecobags.com and Spreadshirt.com have partnered to create an Earth Day Tote Design Contest! Win prizes and praise (as well as commissions) for your artwork and spread the word about Earth Day, the international day to celebrate the planet and environmentalism. One of three 1st positions in the Bestseller Category on Spreadshirt Designer between April 11-22, 2012 (one of the most trafficked areas of the site). Winning design will be featured in the main teaser on the Spreadshirt.com homepage. Second &Third Place: $25 Spreadshirt certificate to print your designs on ECOBAGS® brand totes. Register atSpreadshirt.com as a user. Winners will be chosen by Spreadshirt and Eco-Bags staff on April 10th and announced on April 11th. *Artwork offered on Spreadshirt.com becomes art in the public domain. Visitors to the site will be able to choose & buy your design – you set the price.This is a requirement to participate in the contest. Earthy Day!! Nice thought. I like it.